Tommy Campbell grew up outside of Philadelphia steeped in a musical environment, permeated with the notes of his father, an organist and singer, and his uncle, Jimmy Smith, the renowned Hammond B-3 virtuoso. Tommy attended the Berklee College of Music, the international center for education in professional music renowned for its acclaimed Jazz faculty, where he majored in instrumental performance (1979) and received the Distinguished Alumni Award in 1998. Campbell’s long tenure with Dizzy began in the late 70’s, and continued through the 80’s and 90’s, and concluded with a personal jam session with the renowned master several months before Gillespie’s passing in January of 1993. He has been inspired by legendary drummers such as Buddy Rich, Billy Cobham, Max Roach, the late greats Art Blakey and Tony Williams. 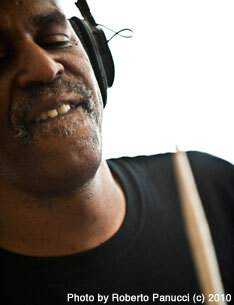 Mr. Campbell has earned a well-deserved reputation as one of Jazz’s leading talents. He has performed as a regular member with Dizzy Gillespie, Sonny Rollins, John McLaughlin, The Manhattan Transfer, Kevin Eubanks, Jimmy Smith, Stanley Jordan, Tania Maria, Gary Burton, and a host of other Jazz greats. Tommy’s intelligent, exciting and stylistically authentic drumming has established him as a leading member of a new generation of Jazz Masters. Tommy, you rocked our world so heavy! Thanks for making our trip so NYC so memorable. You have the best smile ever when you play. It’s the smile of divine light.